Our last day in Dahlonega and it was rainy - yuck! We slept in late and then headed off to The General Store to buy ourselves some goodies. 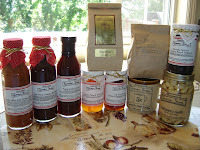 There's so many yummy sounding food items it was hard to choose but we finally settled on Green Olive & Tomato Dressing, Sun-Dried Tomato Marinade, Peach Grilling Sauce, Georgia Peach Preserves, Fig Preserves, Chipotle Olives, Decaf Coffee, some peanuts and a mug. We also bought some treats for CSA brother, who carded for our cats and plants while we were away. SP thought he would enjoy the Habanero Garlic and Georgia Peach Chutney. Then we went next door to the Picnic Cafe for lunch. It's such a cute and cozy place! 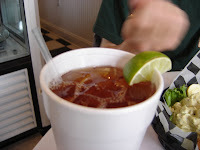 SP ordered his usual (iced tea) and I opted for hot tea since it was rainy and damp. 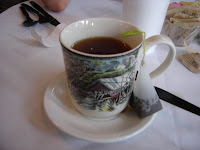 There were several black teas to choose from and I chose Earl Grey. 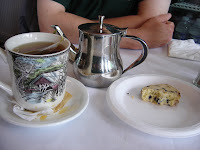 It was very nice to have a cup of tea in a real mug and not in a paper or styrofoam cup!! 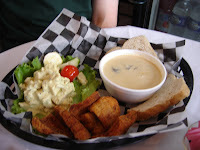 On Thursday, they had beer cheese soup - oh it was so good! I had a cup of it with a spinach-feta croissant. 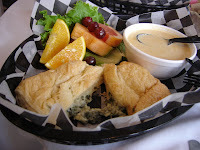 SP ordered the wild mushroom rice soup and had a scoop of apricot-chicken salad with toast points. 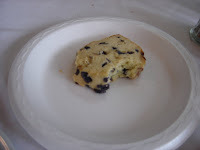 After devouring lunch, we decided to split a blueberry scone. It was as tasty as the cookies were. A delicious last lunch in Dahlonega. I really like the Picnic Cafe.